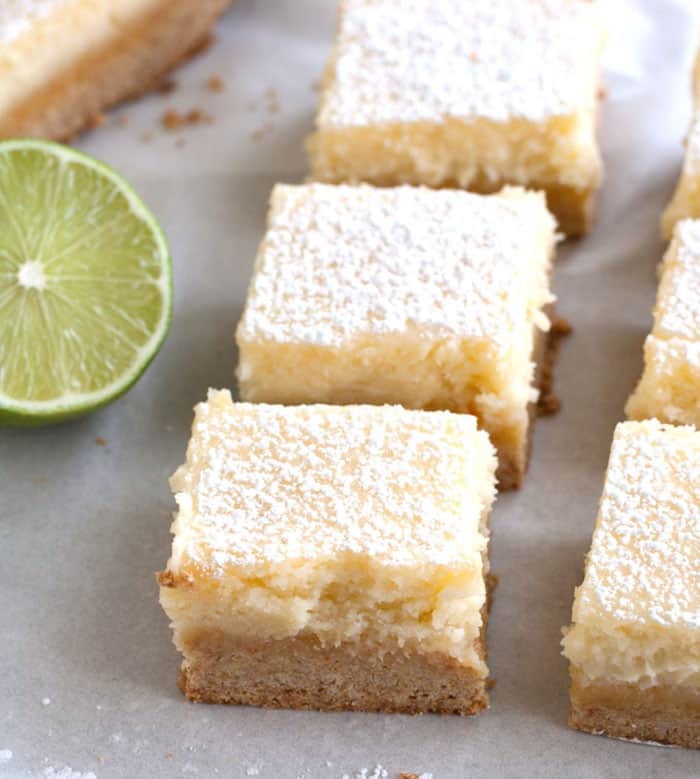 Lime Gooey Cake Bars are perfectly creamy with a hint of lime. A great dessert for spring and summer. Can you believe that we are half way through April already? This year sure is going by fast. Cinco De Mayo, one of my favorite food days, is just around the corner. I think I could eat Mexican inspired food everyday of the week if my family would let me. Some of my favorite recipes to make for Cinco De Mayo are these easy chicken empanadas, margarita fajitas and fajita layered salad. 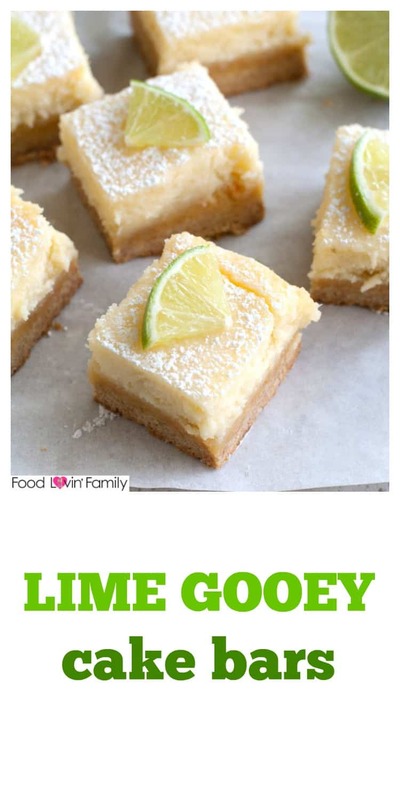 Today, I want to share this delicious lime gooey cake bars recipe. These bars would be perfect for the upcoming May celebration. They are creamy, sweet and have a subtle hint of lime. They remind me of a margarita! These lime gooey cake bars are a take on gooey butter cake. If you have never made a gooey butter cake I highly recommend trying one. They are really easy to put together with just a few simple ingredients. There are many different flavor versions of these cake bars but for spring and summer, these lime bars really hit the spot. The fresh citrus taste makes me want to be pool side. 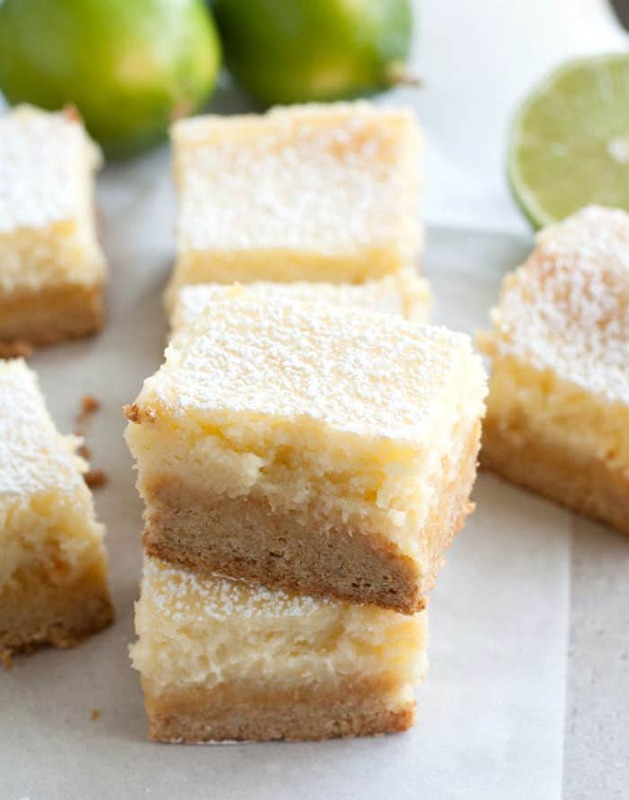 To make these lime gooey cake bars, start with a yellow box cake mix. Stir together the mix, melted butter, one egg and lime zest. Press the crust into an 8×8 baking dish. I line my baking dish with foil and then prepare with non-stick spray. It makes it much easier to lift the bars out of the dish after they are done baking. Next, prepare the filling by mixing cream cheese, powdered sugar, vanilla, eggs, lime juice and more lime zest. Pour over top of the crust and bake for 40 minutes. Sometimes with gooey butter cakes, they will not look “done” when you take the out of the oven. The center might not seem set. Don’t worry, take them out and let them cool for 15-20 minutes. The cake bars will set. To finish, I like to dust mine with a little extra powdered sugar. For more easy and delicious recipes make sure to check out Food Lovin’ Family. 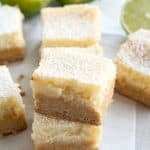 You'll love these easy lime gooey cake bars! They are the perfect spring or summer dessert. They're just like gooey better cake, only better! Preheat oven to 350 degrees F. Line 8x8 baking dish with foil. Spray foil with non-stick cooking spray. In a bowl, mix cake mix, butter, egg and 1 teaspoon zest until combined. Press the mixture into the bottom of baking dish, forming a crust. With an electric mixer, beat cream cheese, powdered sugar, vanilla, lime juice, eggs and zest. Mix until creamy, about 3-4 minutes. Pour over crust and bake for 40-45 minutes. The edges will be slightly brown and center might appear not set. Remove from oven and let cool for 20 minutes. Sprinkle with powdered sugar. Store in the refrigerator.